Shows busy Christians how to serve joyfully, not wearily. Many of us are serving, and feel like we're sinking. We feel joyless, weary and burdened. John Hindley shows how Jesus was telling the truth when he offered people an "easy yoke"—a way of serving him that is joyful and liberating. He explains why serving is so often joyless—and how our identity in Christ changes everything. 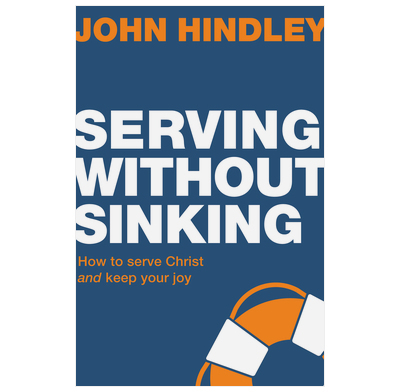 If you are serving, but sometimes feel as though you're sinking… you need this book! If you know someone who has burn out, or is heading in that direction... they need this book too. • Is written in a personal, warm, gospel-hearted style. As I was reading Serving Without Sinking I found myself in conversations with some of the very people it addresses--people who serve their church and who love to serve, but who are also growing weary. It was a joy to recommend the book to them and I anticipate that it will be a great blessing to them. And to you. I am so glad someone wrote this book. It is easy for church service to degenerate into a burdensome exercise in works righteousness—here is good news for anyone who wants to avoid betterness or burn-out. I’m commending this to every elder, deacon and ministry elder in our congregation. Written with excellent biblical insights, the book exposes our wrong motives for serving, points us back to our Lord Jesus, and then wonderfully inspires us to serve him with ongoing joy. The tone is warm, the illustrations are both personal and applicable, and the style is so accessible. I'm thankful for renewed joy in serving Jesus after reading this book, and I thoroughly commend it. I first read this book when it came out, and enjoyed it, but younger in ministry I just didn't grasp some of its brilliance. Several years on and I can greater appreciate its brilliance. You see yourself as in a mirror and it's a worrying sight. Somehow John manages to help you to see your mistakes without crushing you, and gently leads you through a simple biblical understanding of the true heart of service, whilst restoring with insightful questions methods to restore the father's heart behind, and gift of service. This is a good read for all those in any form of Christian service, and those who are not. Be prepared to be challenged and loved. I really enjoyed this book -it's honest and yet loving and hopeful, constantly pointing the reader back to the gospel, Christ's character and what he's done for us. There were helpful insights, some of which were new to me, and I loved the joy, rest and peace that this book points us to when we serve in a right way. Whatever stage you are at in your Christian life, this book is extremely helpful. Hindley writes with both honesty and a real love for Jesus, making this book down to earth but also a joyful read. Whether you love getting stuck into church life or (more likely) you struggle to serve with right motives, or serve at all, this book will help you to serve joyfully, whatever the ministry, and love the trinitarian God even more. I am in danger of becoming a huge bore, the amount I am recommending and talking about this book. Deceptively small, this is a collection of nuggets of theology that, succinctly unpacked, are likely to transform your relationship with God as you serve him. As someone else has said it applies to our service in all areas of life, not just for the church. It's helped us rediscover the pure joy of our Saviour Jesus Christ and how that joy, peace and rest inspires us to truly serve out of love for the One who loves us so perfectly. It's also extremely accessible and easy to read and humorous without being cheesy. Thank you SO much to the author and his wife! Are you a young mum at home with toddlers, a CEO of a big company, a friend, a wife, a daughter in law, a husband, a son, a brother, a vicar, a nurse, a teacher ? All of us are serving in some capacity. This short book will really help you get to the heart of WHY you serve. Is our serving deepening our trust in Jesus or are we just hanging on to a role to prove to the world who we are? The life of faith is never perfect but this book will show you how every day it can be a life which clings on to the person and promises of Jesus. I have found this book to be very simple yet profound in it's implications for day to day living as a Christian worker. Christ serves me first and from this source I can then go on to serve others. The book delves into the motives of our hearts to ask the questions as to what is our real motivation in service. A very useful book that I would recommend to any Christian who seeks to serve with all their heart. John is brilliant at writing at a very simple level, and simply reminds us that Christ served us first and is still serving us today, that's how and why we keep going. I recommended this to friends and the church family because it's all about gospel truths. Plus it's a bargain! Really excellent, challenging and above all a book that reminds us of the LOVE of Jesus. Everyone and anyone who feels in any way burdened needs to read this and re-evaluate our relationship with the God who serves us - that was what blew me away. I read Mark 10:45 in a new way. And this phrase sums it up for me: “Jesus doesn’t want servants, He wants friends. Jesus did not come to help us learn how to be worthy servants—He came to die because we are not worthy servants". But, you might say, don't Paul, Peter et al describe themselves as servants, if not slaves?.....Read on! !